I am back to the decreases on Lancelot. I messed up and had to rip back again 5 rows yesterday. 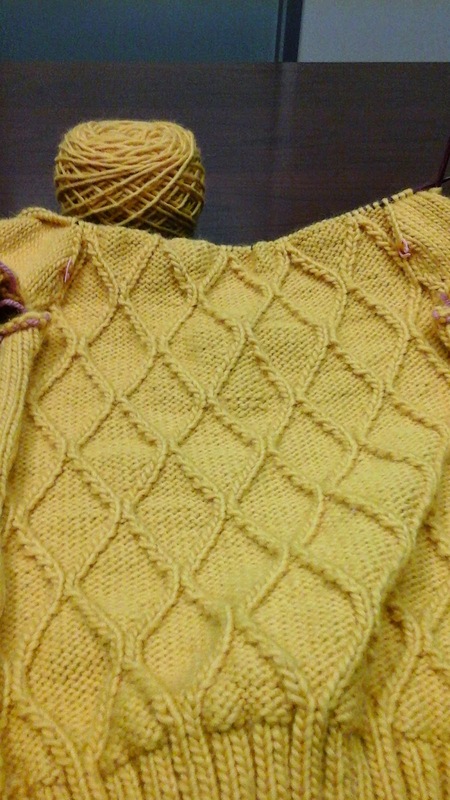 I got a little too much in a hurry, and the knitting suffered. I have finished 4 of the 11 decreases, this time with my stitch markers in the right places. I really want to hurry up and finish this sweater, not because it isn't a lovely pattern, because it is, but because I already have my next one planned. It will be a short one, a quick knit, just for me. I have to take a picture and let you try to guess what it will be. Little Man's birthday is Monday, but his party is not until next Saturday. Since everyone had been sick, we postponed it until then to get the sick germs out and take down all the Christmas decorations. Hubby likes to leave them up through the New Year, and then he got sick and hasn't been able to take most of them down. Once the quick project is done, it will be on to my sweater. Are you ready for that? It will be a massive undertaking, as I have knit this yarn 4 times, and each time it refuses to work. I think it is user error, so I am taking a new approach and will be diligent in taking notes and trying it on. I want a classic, comfy sweater that is warm and casual but dressy enough to wear to work. We will see if I can manage that out of the Lion Brand yarn. I think it will work, the hard part is just getting it to fit properly. I have all the measurements though, and a gauge swatch, so hopefully it will come together. I am also planning a new surprise for you, and it should be up by next month. Keep your eyes peeled!